Location: Huainan, China. 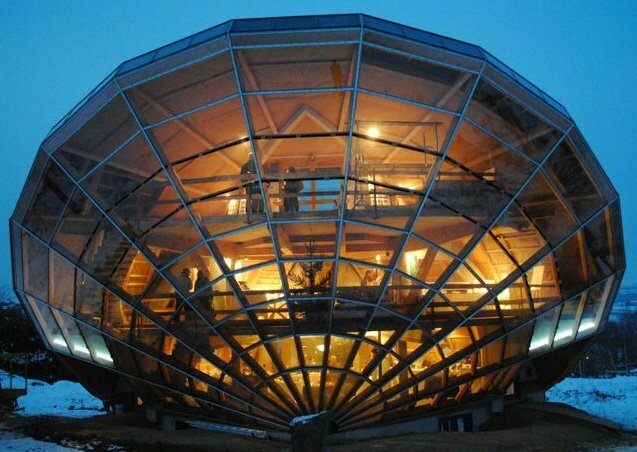 City planners who use it can access this beautiful piano building by taking the escalators inside the glass violin. 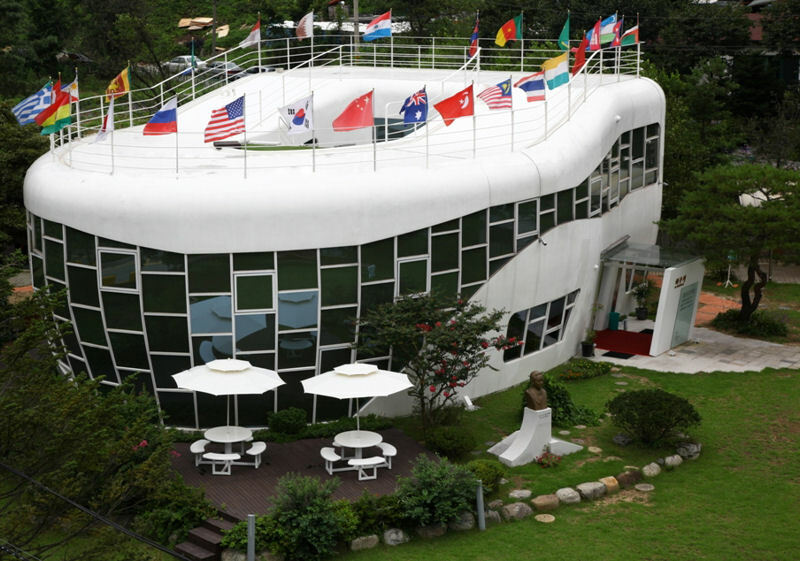 Visit this house in Suwon, South Korea. The mastermind behind this, Sim Jae-duck, not only built this beauty, but also is chairman of the organizing committee of the Inaugural General Assembly of the World Toilet Association. His hopes were that this home would highlight the global need for better sanitation. Well-played, Sim Jae-duck, well-played. This colorful and nautical house can be found somewhere near Mexico City. Javier Senosiain brought this aquatic life to architecture, since him and his family were bored of a traditional-shaped house, and wanted to incorporate nature into the "Bio-Architecture." This woodsy treehouse fit for a fairytale is located in Alnwick Garden, Scotland. Come dine in the unique restaurant within, or make your fairytale wedding a reality by booking a wedding! You thought you lived in a trashy, confined apartment? This redecorated dumpster designed by Gregory Kloehn is found in New York City. This fully-functioning home includes a toilet, outdoor shower, seating area/bedroom, and a real kitchenette which is suitable for any minimalist! The beagle-shaped "Dog Park Bark Inn" is located in the heart of Camas Prairie in Idaho. If this isn't barktastic enough for you-- guests of this B&B get canine-inspired furnishings, and dog-shaped cookies left on their pillows. This rotating house is a luxury holiday home located in New South Wales, Australia. This unusual merry-go-round-like house was designed by Luke Everingham in 2006. If you aren't worried about getting dizzy-- you can take a holiday here, and stay in this spinning house for a pretty penny. Price ranges $350 to $700 per night (for 2 guests), not including an additional cleaning fee of up to $220. This pricey property is located in Hillsborough, California. This iconic landmark was designed in 1976 by Bay Area architect William Nicholson. This unique single-family residence overlooks the Crystal Springs Reservoir. If you can't afford to be a tourist here, take the 3-D Virtual Tour. 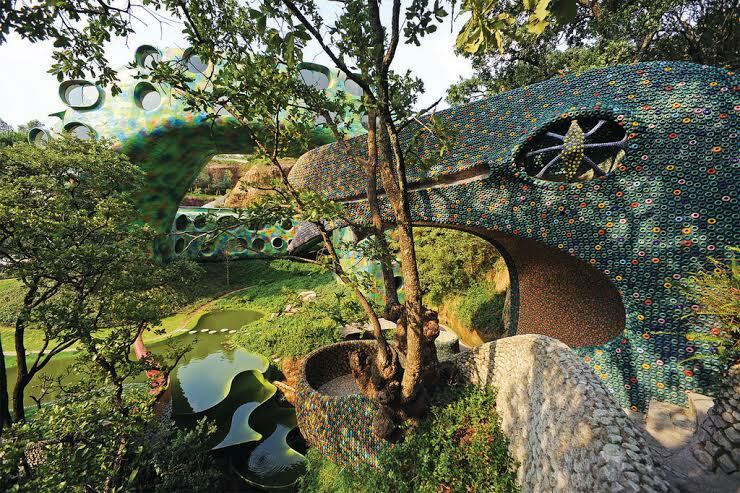 Created by the same Mexican architect who designed the seashell house, Javier Senosiain, calls this "Quetzalcoatl's Nest." This impressive work of snake-shaped art is also located in Mexico City. This 10-house, 5,000 square meter, complex has an amazing scenic view of the whole canyon, and took 3 years to complete. This bio-climatic solar house is located near Strasbourg, Eastern France. This stunning home is a functional sundial that is set on a fixed angle in relationship to the sun's movements; therefore, this cool house can provide shade for hot summer days, and warmth for chilly months. Built by Robert Bruno, this house is mainly crafted entirely of steel, and took 35 years to fully construct. It's located in Ransom Canyon, Texas. If you have 5 minutes, check out the video featuring Robert Bruno discussing the layout of his master creation, and giving a virtual tour. This modular home, designed by Danish art studio N55's, is equipped with solar panels, micro windmills, and composting toilet, so it is self-sufficient. Not to mention that it collects rainwater, so it can be used to grow food and the house has the capability to walk to any desired location. What a perfect energy efficient home for someone who wants to enjoy a nomadic lifestyle.